To salt or not to salt still remains an open question  but there's no question consumers seek sodium-reduced foods. According to the Centers for Disease Control, salt supplies most of our dietary sodium, and most of our salt comes from processed and restaurant foods. In scientific circles, there remains debate on the connection between salt and/or sodium and high blood pressure. There is no debate, however, on the popularity of reduced-sodium foods. Processors have no choice but to meet consumer demands, and demand for low-sodium products remains high. But the key consideration is to reduce salt without compromising the flavor and preservation properties salt brings. Potassium chloride was a natural choice for reducing sodium because of its salty taste and content of potassium, but there is often a negative aftertaste in foods that use pure potassium chloride. More recently, alternatives have been developed. Changing the shape of the salt crystal to deliver more salt "bang" per gram of salt content can work quite well for some snack applications, where surface salting is the delivery mechanism And herbs and spices are a natural for flavor enhancement, as are such astringents as lemon, lime and other citrus derivatives. Such ingredients also are excellent sources of phytochemicals that enhance the nutrition profile of the food while they add to a clean label. However, these ingredients don't solve problems of preservation and texture enhancement that salt provides for certain applications, for instance meats and breads. One of the original uses of salt in processed foods was preservation during times when refrigeration wasn't available. 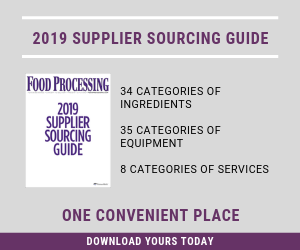 Ingredient technologists have been upping their tech game to find the best balance in all this, often playing off traditional sodium replacers as well as developing all-new technology to do so. As one example, Corbion Purac , Lincolnshire, Ill., has created a salt replacement solution using a process of sugar fermentation. The result mimics the flavor, texture enhancement and preservation properties of sodium chloride. Marketed under the name PuraQ Arome NA4, it is designed to replace about 25-30 percent of the salt in processed meats and 30-40 percent of the salt in bakery products. As a sugar fermentation product, PuraQ Arome contains significant potassium, plus savory flavor notes that can enhance saltiness without the addition of sodium. Functionally, it has properties similar to salt, lowering the water activity and reducing the growth of microorganism to enhance the shelflife of the product. "As a liquid, PuraQ Arome NA4 does change the amount of water used in processing, so minor reformulation of the recipe might be required," says Simone Bouman, manager of business development-foods, for Corbion Purac. "It also adds to the flavor and therefore could reduce the spice needed to give a flavor boost. For bakery products, PuraQ Arome NA4 enhances baking performance by improving bread texture and increasing the volume." PuraQ Arome NA4 has the potential to be used frozen foods as a flavor enhancer, replacing a portion of the salt. However, PuraQ Arome NA4 was not designed for applications such as canned foods, which have relatively high salt content. Other sodium replacement solutions include yeast products. Ohly GmbH, Hamburg, Germany, uses extracts of torula yeast to provide a savory flavor while reducing salt content. Hydrolyzed vegetable proteins have long provided a savory, salt-replacing flavor. Savoury Systems International, Branchburg, N.J., has created new lines of non-GMO hydrolyzed vegetable proteins. The Japanese word has become a fixed part of the food product development vernacular.